Better Bottle Carboy - 3 gal. $24.99 & FREE Shipping on orders over $59. Do you want a stopper or Thermowell? Do you want an Airlock? Carrying and moving carboys can be awkward and dangerous, especially with glass carboys. This Carboy Carrier makes it easy and can support up to 100 lbs of wort or finished beer! Better Bottle is a name known in the home beer and winemaking for their quality products. Plastic PET carboy fermenters are much safer than glass carboys; not only because they weigh less, but they will also not explode into shrapnel if dropped! These are made from Virgin PET and manufactured in such a way that the molecules are tightly packed, and less susceptible to oxygen transfer, resulting in better wine and beer! Aside from it's advantages over glass carboy fermentors, the Better Bottle is relatively impermeable to oxygen. This means that for your wine's or beer destined for aging, this is a perfect choice for an aging vessel! When using the Better Bottle and it's accessories, the transfer rate of oxygen is lower than that suggested for Micro-oxygenation, and insignificant when compared to the amount of oxygen transferred through other bottles and their stoppers. Uses a #10 stopper or a 5 Gallon Carboy Hood w/ white caps. 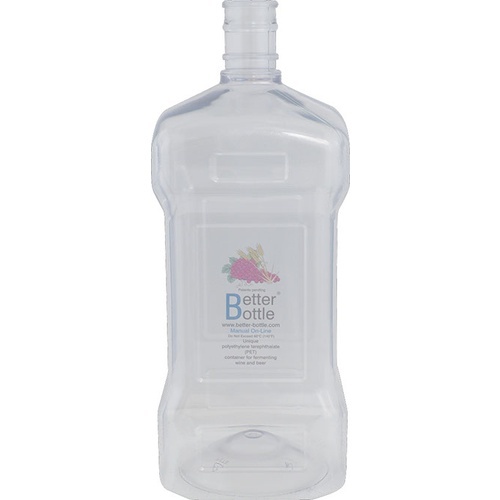 Better Bottle is a well designed PET carboy. Its square and 3 gallon. I just transitioned to an apartment and want to try my hand at new beers, I figure 3 gallon batches would be better to start with. I like to use these 3 gal carboys to split 5 gal batches to experiment with different secondary additions. I also use them to brew smaller 2.5 gal batches to go in my 2.5 gal kegs. Works great. I love these little guys. They are great for splitting batches and ending up with about a case of beer. The tall square shape makes it easy to fit many in a small area. Works perfect for splitting a 5 gallon batch to try different yeast or fermentation variables. Also works great if you want to add fruit or other ingredients to part of a batch in secondary. Its dimensions are also very convenient. When I scaled back to 3 gallon batches this was the perfect fermentation vessel. Easy to clean and handle. The tops accept most airlocks and blowoff tubes. I love Better bottles more than glass or the other plastic bottles I've tried. Why better than glass? Lighter and no fear of the sucker breaking at any point; you can use the top carrier with it completely full (even the 6 gallon). Why better than the other plastics? The shape of the top is more conical than others I've tried and gas flows up it perfectly. And the sort of punt shape at the bottom is perfect to put a softball in and shake around for degassing. I also adore the no water needed air lock from the same company. I used these to split my 5 gallon batches for trying out different dry hop additions, they are easy to clean and easy to carry.